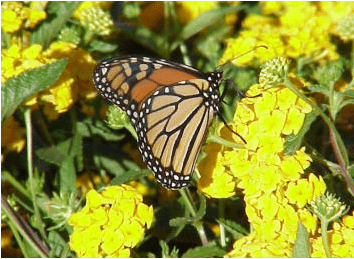 I LOVE helping butterflies and butterfly gardeners. I know, first hand, the agony of watching the babies disappear … I have problems with paper wasps myself. Today I had a reader email me about lizards eating their caterpillars. I sent her a link to a screen enclosure at Petco and she suggested I post the information, and tips, I shared with her on my site … so here it is. Butterfly gardening is amazingly rewarding, but can also be heartbreaking because there are many predators trying to make a quick meal of the caterpillars . In the Wickstom’s case they have an abundance of lizards on their porch which are eating their caterpillars. 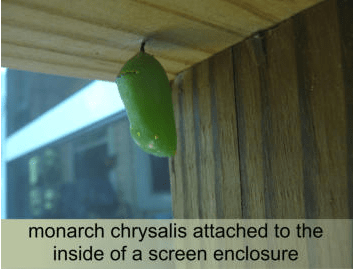 They don’t have a budget to screen in their porch so the next best thing would be a small screen enclosure to house the caterpillars to keep them out of the mouths of the lizards. A quick internet search located a very nice screen enclosure to fit the bill. 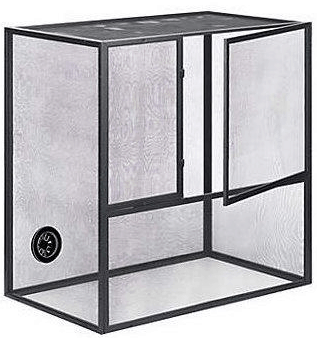 Petco carries a Fresh Air Screen Habitat for Reptiles made by Zilla that appears to be a perfect, read-made, enclosure to house your caterpillars. The large is 30″ x 30″ x 18″ and costs about $85. The medium is 20″ x 18″ x 12″ and costs $45. They appear to very nicely built enclosures made of black mesh screen, water resistant PVC, and aluminum. I have not used this myself, but hopefully one of my readers will let me know how they do for caterpillars. My husband, Mike, built an enclosure very similar to the Zilla model for me a few years ago and it worked great for keeping my caterpillars near and safe. Mike constructed ours out of wood and built a stand for it which made it easier to work in and move around. Of course the Zilla model will work just fine on a patio table out of the elements. The best way to supply your enclosure with host plants is to use potted plants because they will stay fresher and healthier much longer than cuttings. However with limited space, or availability of plants, cuttings off of the parent plant are the next best thing. When using cuttings they need to be kept in containers of fresh water to keep them alive to provide fresh food for the caterpillars. The containers of water will need to have lids to keep the caterpillars from drowning. Don’t ask me how they do it, but they will drown themselves if given a chance. Puncture holes in the lids and fill each hole with a plant stem. If you poke five holes in the lid then insert five cuttings. Leaving an open hole is a recipe for disaster as, goodness knows why, a caterpillar will certainly find a way into the container and be found the next day drowned. Caterpillars aren’t the smartest little things so help keep them safe from themselves. Predators are difficult to deal with especially up close and personal. 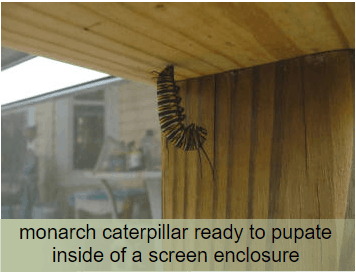 So if you want to keep the caterpillars safe, or just keep them close to observe or take photographs, try a caterpillar screen enclosure.